These microscopic insects will seek out and destroy over 200 kinds of soil dwelling and wood boring insects, including cutworms, armyworms, rootworms, weevils, grubs, fungus gnat larvae, and many more. They are completely safe for people, pets, and the environment, and are compatible with other beneficial insects. 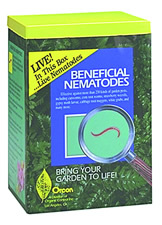 Beneficial nematodes are shipped live in the box and may be mixed directly into the soil and are applied with a sprayer.